Settlers Park — The Land Group, Inc. The Land Group was contracted by the City of Meridian to prepare design documents for a 58 acre signature regional park in Meridian, Idaho. Preliminary work included the entitlement process, site master planning, budget cost estimates, coordination with Ada County Highway District, and public meetings. The Land Group led a multidisciplinary design team of architects, engineers, and surveyors. 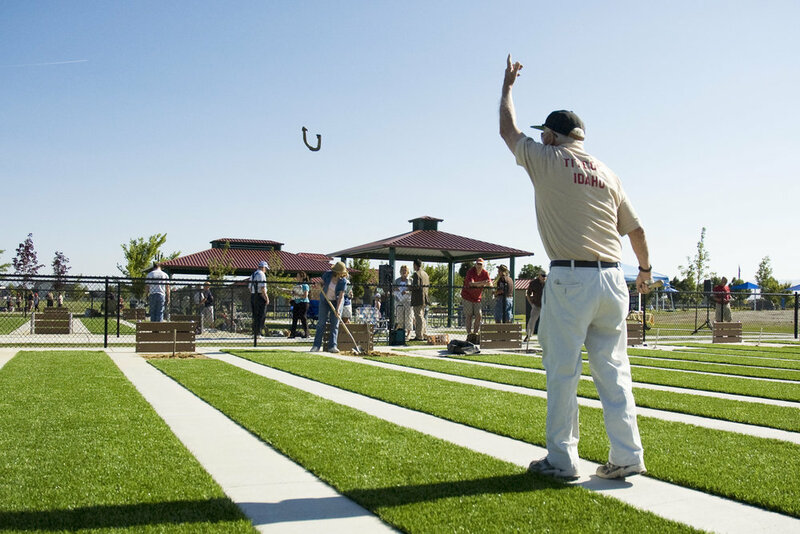 The team worked closely with the owner to develop a program, including site design for overall vehicle access and parking, extensive pedestrian and bicycle circulation, multiple gathering plazas with overhead structures, restroom buildings, a fishing pond, sports fields for soccer and football games, a softball and baseball complex, seven tennis courts, a horseshoe pit, an interactive water feature, and a unique universal playground for children of all abilities. Construction documents included overall site layout and details, off-site street improvements, utility infrastructure design, grading, drainage, irrigation pump system, landscape, bidding phase, construction administration, and project closing.